Briar is sold in two grades, Plateaux and ebauchon. Plateaux briar is generally the best cut of the burl. It includes the top section which has the best graining. It has a rough stubbly top, commonly seen on free hand pipes. It is irregular in shape and size, and for this reason is sold by weight. Ebauchon is traditionally used for machine made pipes. It comes in a couple of different grades. I only carry the Extra, which is the best grade. Ebauchon is available in different sizes, detailed below. 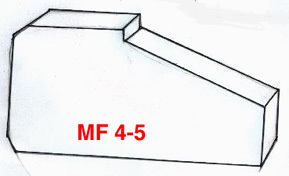 Dimensions :(approximate) H= 3" L= 3 1/2 W=1 13/16"
MFF 2-3 An average size block, suitable for straights and 1/4 bents. Dimensions :(approximate) H= 2 1/2" L= 4 1/2" W= 2"
Dimensions :(approximate) H=2 1/2" L= 5" W=1 3/4"